The extensor tendons of the hand are important parts of our normal hand function. These tendons are located on the back of the hand/wrist and work together to straighten, or extend, the fingers. Each finger is controlled by at least one extensor tendon (the EDC tendon) which begins as a strong muscle in the forearm. The index and small fingers often have an additional extensor tendon (EIP and EDQ tendons). The thumb extensor tendon is called the EPL tendon. 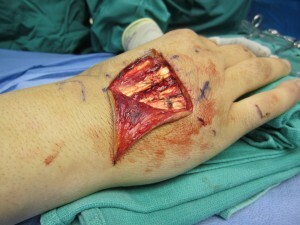 Extensor tendon repair surgery may be needed for a cut tendon. There is an important relationship between form and function in the hand. A delicate balance exists between the bones, joints, and soft tissue structures. A small disruption of this fine balance can affect the overall function of the hand. This is made apparent with extensor tendon injuries of the hand. An extensor tendon laceration (cut) usually is caused by a sharp object such as a piece of glass or knife. This diagnosis is usually obvious to the patient and physician, as the patient cannot lift (extend) the finger after a deep cut. Associated injuries to the bones, joints, nerves, and blood vessels of the hand are also important to rule-out. Although tendons cannot be seen on x-rays, an x-ray may be ordered to look for a fracture or retained piece of glass or metal in the tissues. Early diagnosis is very important to obtain the best outcome. The laceration should be cleaned thoroughly with warm running water to help prevent infection. Seek medical care if the bleeding is not controlled with pressure, if there is numbness in the finger, and/or if there is limited range of motion in the finger. If there is a tendon injury suspected, the urgent care or emergency will often refer the patient to a specialist. 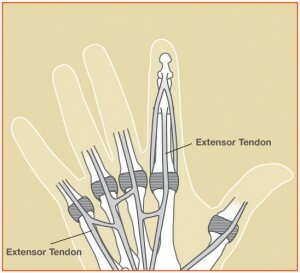 Extensor tendon injuries in the hand are usually treated by an orthopedic surgeon, plastic surgeon, or hand specialist. The treatment plan depends on which tendon was cut and at what location. When an extensor tendon is completely lacerated, the muscle belly in the forearm pulls the two ends apart. This gap prevents the tendon ends from joining back together and healing on their own. Surgery is used to reconnect lacerated tendon ends with sutures. In cases of partial tendon laceration, some tendons can heal on their own if a patient uses a proper splint. The extensor tendon repair surgery is usually performed as an outpatient using anesthesia with numbing medicine. During surgery, the tendon ends are identified and repaired using strong sutures. This is called a “primary repair.” Injured nerves and/or arteries are also addressed at the time of surgery and repaired if needed. If there has been a delay of more than a couple of weeks, it may not be possible to bring the ends of the retracted tendons back together and perform a primary repair. 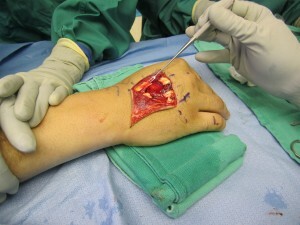 In this case, a tendon graft can be used to bridge the gap, or the tendon can be attached to an adjacent intact tendon. 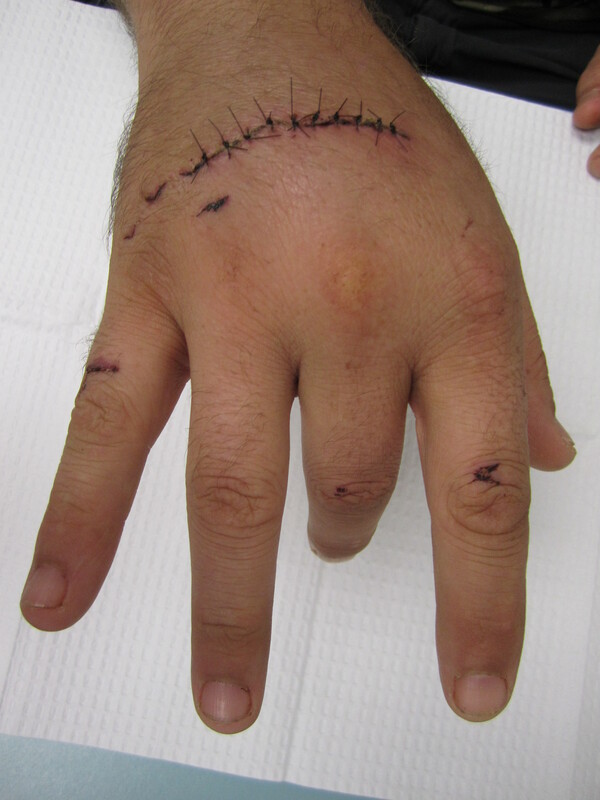 Hand therapy is important in the recovery from a repaired extensor tendon laceration. The hand therapist will guide the patient through the rehab program and promote an increase in range of motion and reduction in swelling, scar tissue, and pain. While the tendons are still healing, it is possible to break the repair. Therefore, exercises are performed carefully. Rest and elevation of the hand to the level of the heart is very import for the first few days after surgery to reduce swelling. After the surgery, the wrist and fingers will be immobilized in a plaster splint to protect the repair. The splint will be removed in our clinic after a few days and a removable splint will be made. It is important to protect the repair as it heals and avoid attempting to make a fist or bending (flexing) the wrist. This can put too much stress on the repair. At first, the therapist will focus on reducing pain, swelling, and increasing range of motion. Later, as the tendon repair heals, strengthening will be emphasized. Most patients can return to more normal function at about 3-4 months post-operative, but maximum improvement can take 6 months or so. Recovery time varies among patients, depending on the severity of the injury, possible complications, and pain tolerance of the patient. Sometimes people do not regain full range of motion or strength after the injury. My goal is to help each patient obtain the most function possible. Possible complications include bleeding, infection, swelling, stiffness, rupture of the repair, and damage to the surrounding nerves and blood vessels. If scar tissue and stiffness become a major problem, an additional surgery is occasionally needed to remove scar from around the tendons. Below are pictures of a surgical repair.